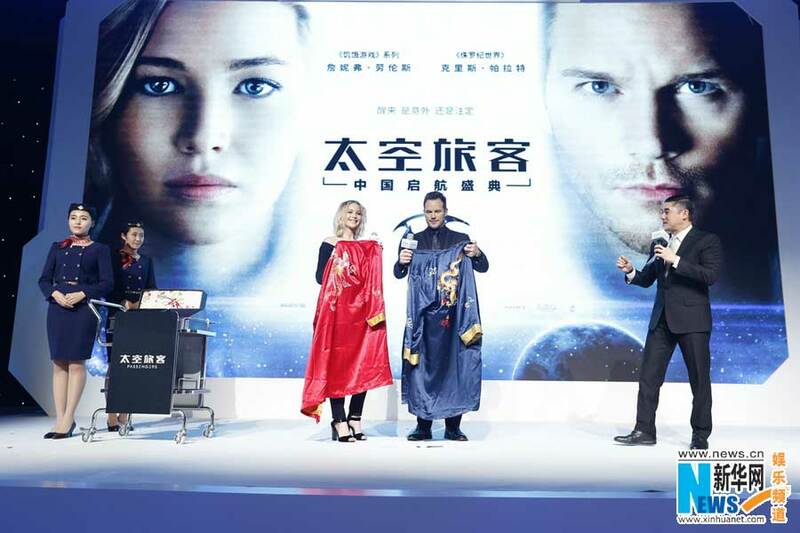 Stars Jennifer Lawrence and Chris Pratt, hit the red carpet in Beijing to promote their latest film, "Passengers" on Saturday. Directed by Morten Tyldum, "Passengers" is a science-fiction flick, that is large in scope but character driven. Lawrence and Pratt star as two passengers, Aurora and Jim, who are on a 120-year journey to another planet. But their hibernation pods wake them up 90 years too early. They are forced to unravel the mystery behind the malfunction as the ship teeters on the brink of collapse, with the lives of thousands of passengers in jeopardy. "What I loved so much about the movie, when I read it I loved the story of these two people this doomed but beautiful love story, and it wasn't really until I saw the movie that I saw how exciting and action-packed it really is because when you are just reading it on the page, you don't have all of these special effects and these huge action scenes that took weeks and weeks to shoot," Lawrence said. With Lawrence and Pratt in practically every scene, chemistry between the two stars was vital. For Pratt, working on a movie that challenges viewers was key to his decision to take part.... that, and the possibility of acting alongside Lawrence. "I loved the challenge that this posed to all audience members as they watch it, questioning themselves and how they would react in this situation," Pratt said. "I think it's really daring and thought provoking, it was unlike anything I'd ever read before and it's just utterly original and that's what really appealed to me. And the prospect of working with Jennifer." "Passengers" premiered on December 14th in Los Angeles. It is yet to have a release date in China.